Duff -- You are correct. Had a mind fart. I'm fairly certain that the "Betcha can't eat just one" ad campaign was for LAy's potato chips, not Granny Goose. My friend, Rich, always claimed to have knowingly eaten just one. Granny Goose Potato Chips, bet you can't eat one...I said just one. 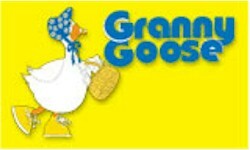 You may not believe this, (pause) but my name is Granny Goose. I seem to remember there was a commercial for GG. It had a guy wearing a white suit, and he went on claiming that he was THE Granny Goose. Gawd, I'm really getting old. Granny Goose has been back for a couple of years. They are made by two companies: The one that makes potato chips is in Ohio while the one that makes everything else is in the Los Angeles area.